Devil's food cake, fluffy white frosting and Oreo™ cookies capture the fabulous flavor of a favorite ice cream. Heat oven to 350°F (325°F for dark or nonstick pans). Place paper baking cup in each of 24 regular-size muffin cups. Make and bake cake mix as directed on box for 24 cupcakes. Cool in pans 10 minutes. Remove from pans to cooling racks. Cool completely, about 30 minutes. In medium bowl, stir together filling ingredients. Spoon into small resealable food-storage plastic bag; seal bag. Cut 3/8-inch tip off 1 bottom corner of bag. Insert tip of bag into opening in each cupcake; squeeze bag to fill opening. Frost cupcakes. Garnish each with about 2 teaspoons broken cookies. Store loosely covered. You can easily crush the cookies by placing them in a resealable food-storage plastic bag and pressing with a rolling pin a few times. A food processor or blender also works well. To easily scoop the marshmallow creme out of the jar, lightly spray a rubber spatula with cooking spray. The sticky marshmallow won’t stick quite as much. 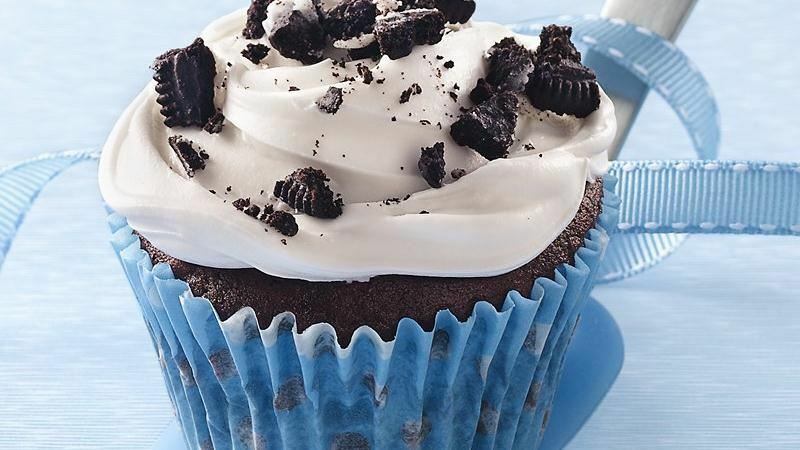 Summary: Devil’s food cake, fluffy white frosting and Oreo™ cookies capture the fabulous flavor of a favorite ice cream.